So many people get wrapped up in not getting invited to private events that they lose focus of why they registered for this conference. My suggestion would be to write down five goals that you have for this conference. Are you hoping to gain additional knowledge in your niche area? Are you hoping to connect with bloggers? Or to get the opportunity to get that dream chance to speak with a brand in person. Never lose focus of the real reason why you're attending this conference. If you haven't already done so. Create budget. Blogher typically offers breakfast and lunch so you want to budget for dinner and snacks. Plus, if your planning on visiting Disney. That's another expense that you want to include. It's also very important to know how much you're spending on this conference. Thank me later. Lodging, airfare/travel, food? Business cards, brand attire? Create a budget and save receipts. Don't forget to stay in your lane. If you're going out to eat with other bloggers and you can't afford Filet mignon. Order what you can afford. All blogger income are different. Don't try to keep up with the Jones. Blogher'17 has an app that you can use to plan out your schedule. You don't want the conference day to arrive and you're just sitting there trying to figure out what you're going to do next. Create a plan A, B, and C plant. You may currently have a plan with one of your Blogger Besties and she may get invited to a private event. So what's your next plan? Are you going to just sit in your room or are you going to network with other bloggers? Triple check your emails daily and also check your spam folders. Blogher'17 has been making changes and announcements on a daily basis. You can also be invited to events so, check your emails to make sure that you're not missing out on anything and/or someone is not trying to get in contact with you. My first year of attending Blogher. I won a giveaway and was contacted by the brand email. Had I not check out my email I would have missed out on a really cool prize. I've mastered the art of packing light. I don't plan on over packing for this conference. I know that's easier said than done. Now that you're finalizing your schedule. Figure out what outfits you need for what. Of course, you might bring an extra outfit or two but you really don't need to bring your entire closet with you. It's ok to relax and take everything in. When I attended my first blogger conference. I honestly was just going with the flow of things. Don't get so caught up on the “what if's” take some time to actually enjoy yourself. You're going to be ripping and running throughout this conference and honestly, if you're anything like me, you're going to be walking right into the reality. Try to batch/schedule all of your social media and blog posts prior to the conference. I've learned that it just makes life a lot easier when you don't have a million things waiting for you upon arriving back home. Create a to-do for items to take care of upon your arrival. Also, make time for self-care. The most important task that people forget to do is follow up after a blogger conference. Not only should you follow up with the Brands you've connected with. You should also follow up with Bloggers you connected with. You have no idea what that relationship could possibly lead to. Don't forget that brands ask for recommendations of other bloggers and you can be the blogger to get recommended to a brand. Are you attending Blogher'17 this year? I had no idea this was going on this month omg I need to keep up! Thanks! This is my first time seeing it scheduled for June. It's usually scheduled for July or August. I love going to summits and conventions. I would love to go to this one, maybe next year. These are some great tips for any summit, especially following up!!! Packing light would be a challenge for me. I am absolutely terrible at packing. I wish I were attending! I had no idea about this conference! Hope that you and your blogger friends have a lot of fun. Sounds like you'll be prepared for it! How I wish I could make it up for this year convention. I can see there's gonna be a lot to learn. I don't know what exactly this is as I am new to Blogging World. Would love to know more about it. I wish I were attending but I missed it! Hopefully try to attending next year! But looking forward to all the updates about this event in your future posts! Oh How I wish I was there. I missed blog her in NY 2 years ago. Hope it comes back. Tasheena these are excellent tips! 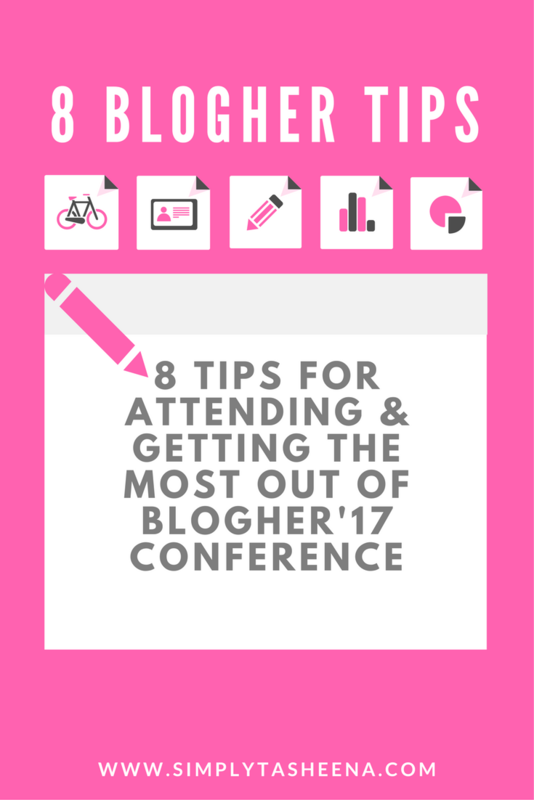 I am planning on going to Bloggy Con in September, will you be there? I am also from CT! Do you attend any meetings or conferences, or blog for any other bloggers in the CT area?